Do I Need To Hire A Medium Van? Medium-sized panel vans offer a fairly large load space without being too big themselves. They are a popular choice of van amongst plumbers, joiners, builders and delivery drivers due to their practicality. A vehicle such as a Ford Transit Custom provides around 5-6 cubic metres of load space in a vehicle that isn't much larger than a large car, together with a payload of around 1,000kg (models vary). Fuel consumption is good too, with modern turbo-diesel engines providing fuel economy in the 35-40mpg range. These models are car-like to drive and are often fitted with a decent selection of creature comforts, such as electric windows, aircon and sometimes even infotainment systems. 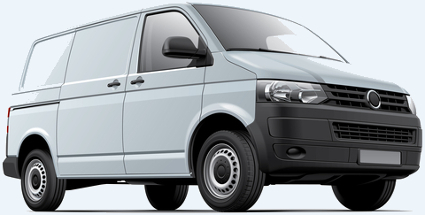 Vans this size are available for hire from almost all van rental companies - any of the hire companies listed on this site will be able to provide you with a medium van. Some of these vans are a little larger than others - check before you hire. Payloads are usually in the region of 900kg - 1200kg. If you aren't sure what size is right for you, take a look at our what size van? page to work out what you need.